FORT WORTH, Texas – The slap that put Texas Motor Speedway smack-dab on the motorsports map continues to sting _ continues to stir hardened emotions _ two decades after the dizzying array of events surrounding the night of Saturday, June 7, 1997. The True Value 500k, the inaugural open-wheel event at TMS, crowned Billy Boat and then Arie Luyendyk as winners in a pair of Victory Lane celebrations two years apart and with separate trophies. The press conference on the Sunday morning after featuring embattled U.S. Auto Club Chief Steward Keith Ward and cohort Art Graham, USAC’s Director of Timing and Scoring, was overshadowed by a rant delivered by TMS President Eddie Gossage punctuated by a well-planned door slam. But the weekend’s defining moment remains “The Slap Heard ‘Round the World,” as delivered by native Texan and Indy car legend A.J. Foyt Jr. to an unsuspecting Luyendyk after the Dutchman dared to question Boat’s first win in Tony George’s fledgling Indy Racing League. A stroke of luck in the form of apparent leader Tony Stewart’s blown engine two laps from the checkered flag put Boat into the lead on Lap 207 of the 208-lapper around TMS’ high-banked, 1.5-mile quadoval. Boat was credited with winning under caution as A.J. Foyt Racing teammate Davey Hamilton placed second and Luyendyk third. But Fred Treadway, Luyendyk’s team-owner, was already preparing to file an official protest over the scoring when Luyendyk exited his car and headed toward Victory Lane. Down goes Arie. A.J. 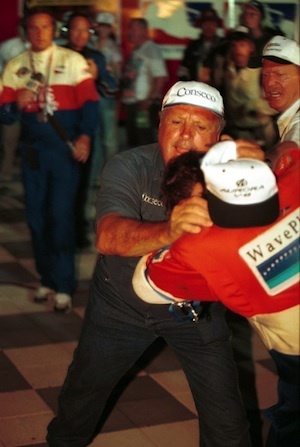 Foyt didn’t take kindly to Arie Luyendyk’s uninvited appearance in Victory Lane at Texas Motor Speedway in 1997.
with a back-handed slap to Arie’s head, a blow that along with a flower planter, briefly sent Luyendyk to the pavement. In an instant, the event billed as “America’s Original Nighttime IndyCar Race” had morphed into a scene right out of a rough-and-tumble Texas dirt track. 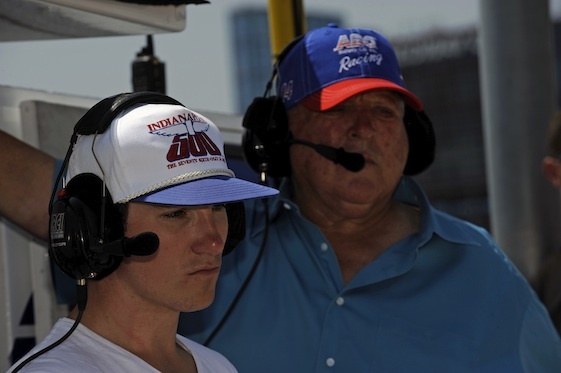 Sunday’s story in the Sports section of the Fort Worth Star-Telegram was accompanied by the now iconic photo of an incensed Foyt with his left hand wrapped around Luyendyk’s neck, the latter’s white hat askew. In a world where there’s no such thing as bad publicity, “The Slap” has cemented its place among the top two moments of TMS’ 20th anniversary season. “I would say it has to rank as the strangest moment at Texas Motor Speedway…but that may not be true,” said Gossage, never shy about swatting a promotional softball. “Certainly it was a coming-of-age thing for the speedway as it put us on the front page of newspapers all around the globe. The announced crowd of 128,000 that filled the frontstretch grandstands went home thinking Boat had won. But early Sunday morning Ward confirmed that a major timing and scoring error had occurred. After USAC officials spent the night auditing three separate scoring systems, Luyendyk _ who had qualified 11th and led twice for 20 laps _ was declared the winner. Graham explained that Luyendyk’s No. 5 Treadway Racing/Wavephore G Force/Aurora did not get scored when he went onto pit road twice, meaning he lost two laps. “Every time I came into the pits my transponder didn’t record the lap,” Luyendyk said. Graham further explained that Luyendyk had taken the lead from Stewart on a pass with 19 laps remaining. So when Stewart’s engine blew after leading a race-high 100 laps, sending the IRL’s “Poster Boy” crashing into the Turn 1 wall, he actually was running second to Luyendyk. Foyt remains unconvinced and unmoved. “Fast as we was running… there was four or five laps to go and we came by him (Luyendyk) and waved him by because we were a lap or two ahead,” Foyt said. ”I know we won it. Why would we have waved him by? We’d be an idiot. Gossage had walked into Victory Lane on a public relations high, ready to capitalize on Texas icon Foyt and his team winning the first open-wheel race in Fort Worth. It was the proverbial PR layup. “I’m standing in Victory Lane and can’t see anything _because of the TV lights, the stadium lights _ you’re blasted,” Gossage said. “If you drive into Victory Lane I’m going to give you a trophy. So here’s Billy and A.J. and I had no questions (about the outcome). All of a sudden there’s a silhouette and I can’t see who it is but he’s screaming and cussing at me…with expletives deleted… ‘Why are you giving them the trophy? I won the race.’ Can’t see who it is but I know the voice. It’s Arie Luyendyk, my old Milwaukee neighbor. Gossage was a few steps from Luyendyk when all hell broke loose. “I see A.J. coming around the back of the car and Billy’s to my left,” Gossage said. “I’ve got this fragile, glass trophy I’m holding and about to present and I see A.J.…and oh, Lord, for a big man he’s pretty quick. He stood there for an instant but once he understood what was happening, he was really ticked-off. Arie turns to leave and A.J. does this little backhanded slap near his left ear…a real loud slapping sound…and he shoves Arie’s left shoulder. We had these little (flower) planters in Victory Lane and Arie trips over one of the planters. Gossage said once the frenzied ceremonies were concluded, he went over to the Indy Racing League trailer in search of Leo Mehl, the organization’s executive director. Instead, he found Luyendyk. “I let him have it. I’m dressing him down…waving my finger at him,” Gossage said. “But Leo Mehl nods and says, ‘He won.’ It’s now 10:30 p.m., and what are we going to do? Leo said, ‘We’re going to start a manual account of the scoring.’ You typically have a backup system, old-fashioned hand-scoring as they cross the line. It’s going to be 2-3-4 (o’clock) in the morning before it’s done. Gossage said he drove home and got two hours of sleep before returning to the track for the USAC press conference in the infield media center theater. Rather than conduct the session from the stage and podium, Gossage sat down in the theater’s high back row, behind most of the media. “Art Graham (USAC’s Director of Timing and Scoring) is up there and explains that Arie didn’t get scored when he went onto pit road twice, which means he lost two laps…the computer didn’t score him,” Gossage said. “Art Graham said, ‘The speedway’s timing and scoring equipment failed.’ Well, we don’t have any timing and scoring equipment. 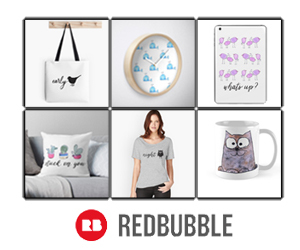 He said it a second time…and I said ‘Whoa, I did here that! ‘A few minutes later for the third time he said the speedway’s timing and scoring equipment didn’t work. Boat, who was substituting for the injured Scott Sharp in Foyt’s No. 1 Conseco A.J. Foyt Racing G Force/Aurora, remains in lock-step with “Super Tex” on the outcome. “There’s no question, as I stand here today, that we won that race,” said Boat, who had started 21st in a 26-car field. “To this day it’s unfortunate that we lost that victory and the fans left thinking we won the race and then the next day we didn’t. I think it was only maybe my fourth or fifth (IRL) start. At the time you’re disappointed, but I’m not bitter today. We came back the next year and won the race and that was vindication. Luyendyk said his True Value 500k hardware is on display in the trophy room in his garage. “My wife, Mieke, says it’s my ‘I Love Me Room’ _ and it’s a cool room,” Luyendyk said.